The month of September proved to be quite a good vegan foodie find month. It happened haphazardly, but nonetheless it was quite easy. I will probably keep saying this till the day I die, but if I hear one more person tell me that Dallas isn’t vegan friendly. I tell ya what, I’d rather be drowned in a pool of fire ants than to hear those words again. Can’t do it. The opposite is true and if you’ve been reading my monthly post, you know indeed it’s easy and delicious to eat vegan in Dallas. As the end of the year fast approaches I’ll be finishing out the commitment I made to this monthly post. I’m not sure if I will continue it into 2018, there’s some very big projects I’m working on and eating out will be taking a back stage. Hopefully you will refer back to my 2017 post when you’re in a pickle on where to eat. There’s plenty of new things popping up each day too. I can only think of one way to close out the year and that’s wth an extensive list of all the vegan and vegan friendly food choices in the Dallas area. Look for that post in December. Until then, here’s what I ate in September. A plate of sizzling veggies at Mi Cocina served alongside a heaping of guacamole and salsa is a Texas girls dream. Thank goodness they have locations scattered throughout the Metroplex for times your in a hangry bind. Don’t get me going on the Mamba Taxi’s! Note: limit two. Guilty, I admit. 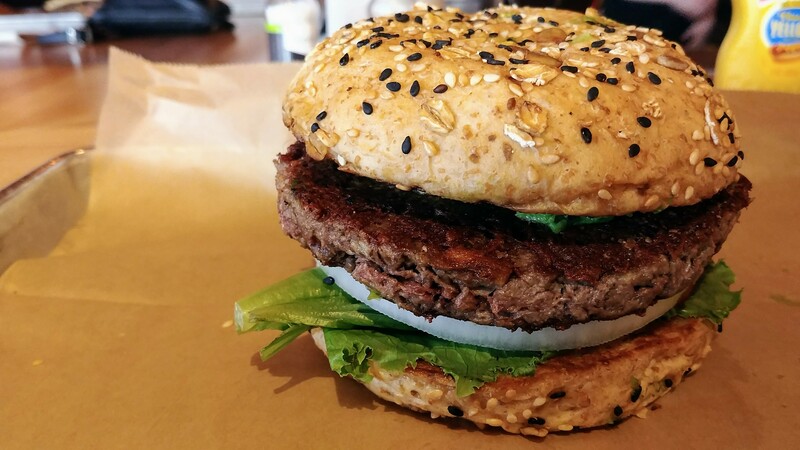 I went back to Hopdoddy for another dose of the Impossible Burger. It was better the second go around folks. Please remember to change the bun and ditch the sauce to keep it vegan. The Twin Peaks locations started carrying it too, but unfortunately when I went they were plum out. I want to believe this is a good thing. Thanks to the whole Twin Peaks burger debacle, I was fortunate Trinity Hall was right next door. 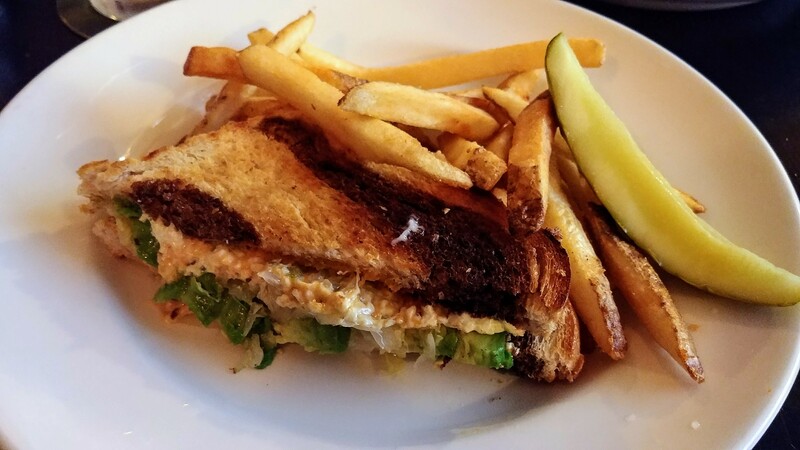 I shared one of the best vegan Rubens I’ve ever had along with a basket of chips and their vegan queso (pictured as featured image). I appreciate Trinity Hall has an extensive vegan menu offering that fits the bill for any appetite. 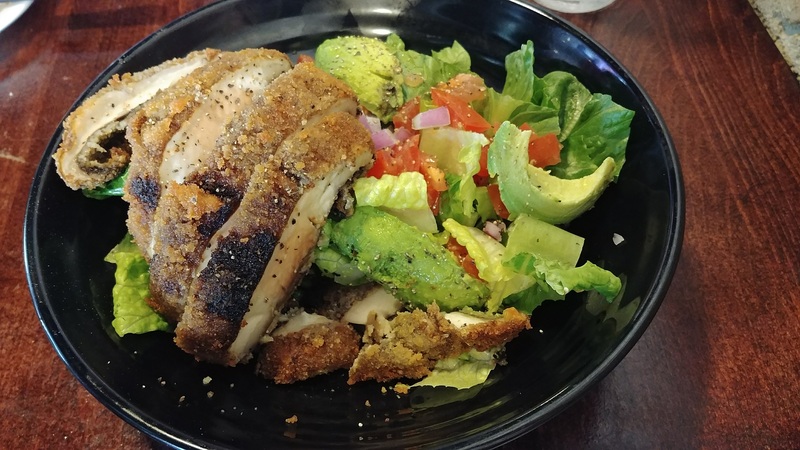 My picture didn’t give this dish justice, but this is a delicious salad from the Green Door Public House in downtown Dallas. A quaint building located near the Farmers Market, it makes a good place to go to watch your favorite sporting event. It’s also a good place for a stiff drink and various diet choices. I simply asked for a salad, added portobello mushroom patty and avocado. Done! Back in the Farmers Market, the bonus find this month was Mudhen Meats and Greens. I’ve ate here before and was a bit unimpressed. This go-around I was taken over the edge in a very good way. 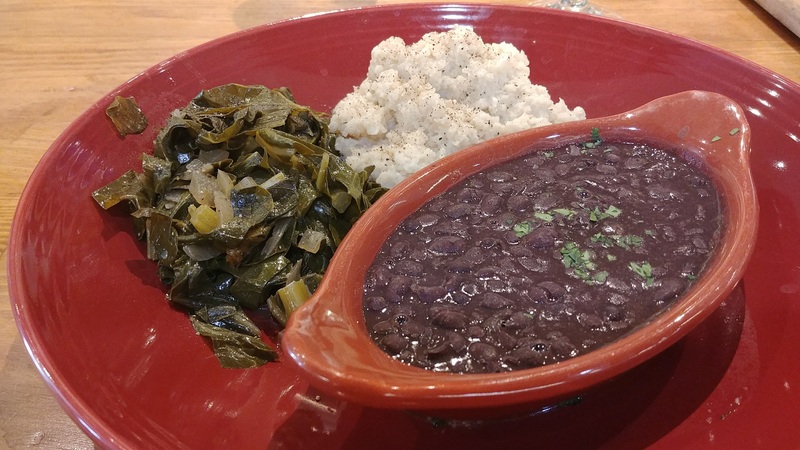 Black beans, rice, and collards. Mudhen keeps a blackboard of daily vegetable offerings and nicely indicate the vegan ones. They also have a lovely hummus platter for starters. I plan to be a regular. Where are you eating this month?